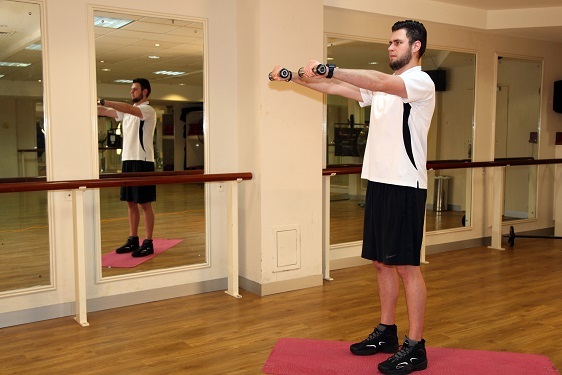 Stand with dumbbells in each hand and feet shoulder width apart. Have your arms fully extended down by your thighs in front of you. Using an overhand grip with your palms facing your body begin to raise your arms straight out in front keeping your palms facing the floor. Make sure you keep a slight a bend in your elbows as you raise arms so they are parallel to the ground. Pause for a moment at the top and lower your arms slowly back to the starting position.